Sonny Boy Folkfore Remedies to Remove Evil Relatives. Overcome Greed. Remove a Jinx! SONNY BOY® Hot Foot Go Away Stay Away - Sonny Boy spiritual and religious oils, incense, bath wash, salt crystals, sand, bar soap, spray and spiritual faith candles. Hot Foot. Go Away! Stay Away! Relatives...Bad Influence...Friends...Lover. Get Out Of My Life! - Get Out Of My House! We all know, those closest to us can cause us the most pain. Write the troublemaker's name on brown paper. Anoint the paper, then slow boil the paper in a pan of water. Throw the water in their path, or on something that belongs to them. Burn the paper in incense. Sonny Boy says always use a kit for strongest action. SONNY BOY® Crossing - Sonny Boy spiritual and religious oils, incense, bath wash, salt crystals, sand, bar soap, spray and spiritual faith candles. CROSSING - Cause Trouble For Your Enemy. Cause A Block! Cleanse your hands with Holy Water before using. Draw 9 lines on a paper. Write your enemy's name on each line. Daily - tear off l line with their name off the paper, anoint with oil, and burn it in incense and vision the person you want to cross. Say the condition you want to inflict. Put the ash in a dark place. On the 9th day, scatter the ash away from your home. Sonny Boy says always use a kit for strongest action. SONNY BOY® Confusion - Sonny Boy spiritual and religious oils, incense, bath wash, salt crystals, sand, bar soap, spray and spiritual faith candles. CONFUSION	- Put a Block Between You and Your Enemy. My Enemy. Confuse Their Efforts. They Won't Know Which Way To Turn! Vision your enemy. Write their name on white paper, and tie black thread or sew black thread around the paper. 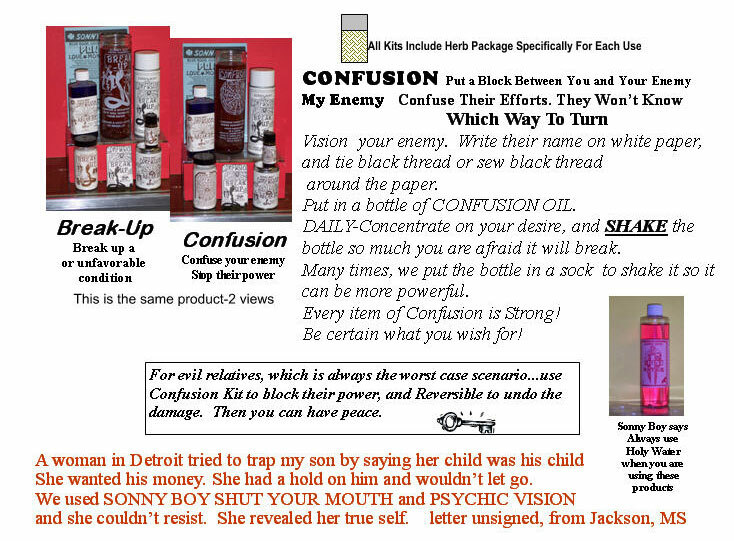 Put in a bottle of CONFUSION OIL. Daily - Concentrate on your desire, and shake the bottle so much you are afraid it will break. Many times, we put the bottle in a sock to shake it so it can be more powerful. Every item of Confusion is Strong! Be certain what you wish for! Sonny Boy says always use a kit for strongest action. SONNY BOY® Shut Your Mouth, Stop Gossip - Sonny Boy spiritual and religious oils, incense, bath wash, salt crystals, sand, bar soap, spray and spiritual faith candles. SHUT YOUR MOUTH! Stop Gossip! Stop a Liar's Evil Tongue! Write the one you want to control on brown paper. Fold the name inside and drop it in water and freeze. If you will be in their presence, take the frozen paper out and anoint where they will cross. The frozen paper with their name has a very strong. Controlling Power in any situation. You can anoint any area where they will be with a paper with their name on it, which is anointed with the oil or spray and the effect will be the same. A lot of people take this to court. They say it is effective. Sonny Boy says always use a kit for strongest action. Sonny Boy Spiritual Products can remove the ill will in your life. Let Sonny Boy free your life of stress and unhappiness. 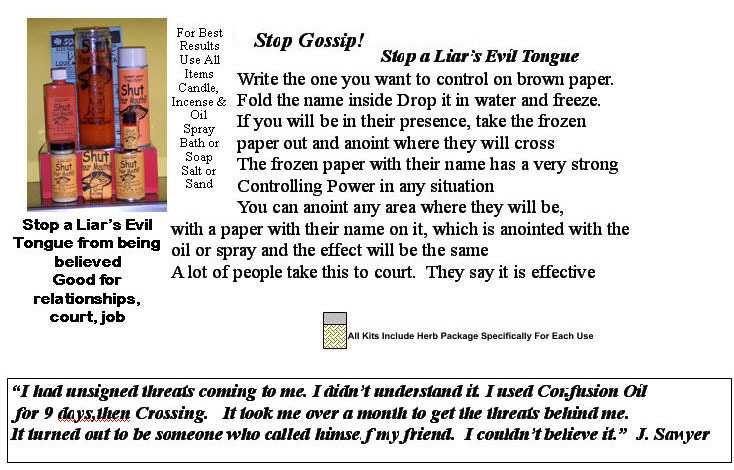 Use Sonny Boy Confusion Break Up items to remove interference from relatives, or two-faced friends, co-workers, etc. Break-Up bad situations, or break up a frienship or love affair that is causing you harm. Remove this from your life. Find Happiness and Peace. 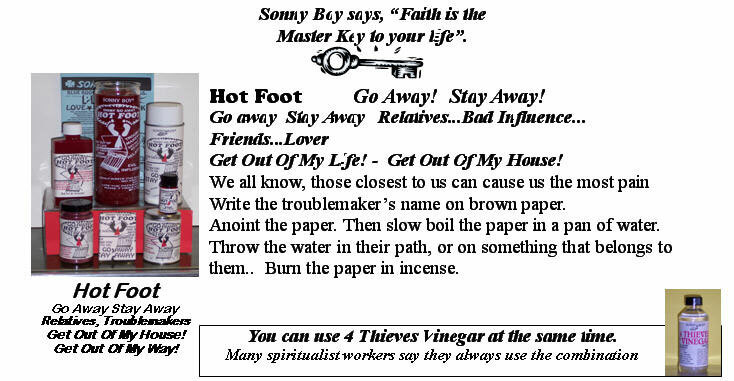 Sonny Boy Hot Foot items will remove someone totally from your life, or your home. These are sure-fire workers. Burn Sonny Boy Novena Candles, use the incense and oils and other items in the kits. You will draw the blessings you need.